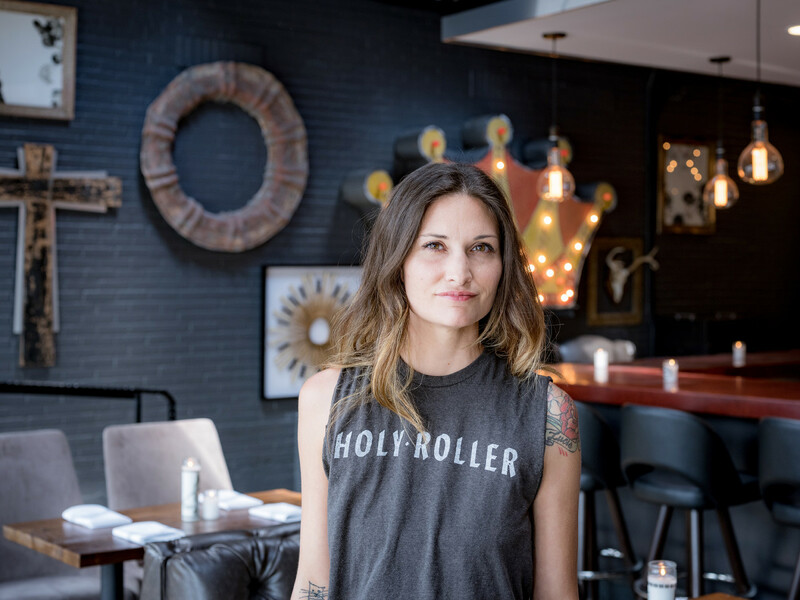 Chef Callie Speer has finally opened her brunch-all-day diner in the former Wahoo's Fish Taco space at 509 Rio Grande St. One of the most anticipated restaurants of the year, Holy Roller combines irreverence with elegance, kitsch with comfort, and a rocking soundtrack as the first venue where Speer will be cooking savory dishes, a departure from her previous gigs as a premier pastry chef. 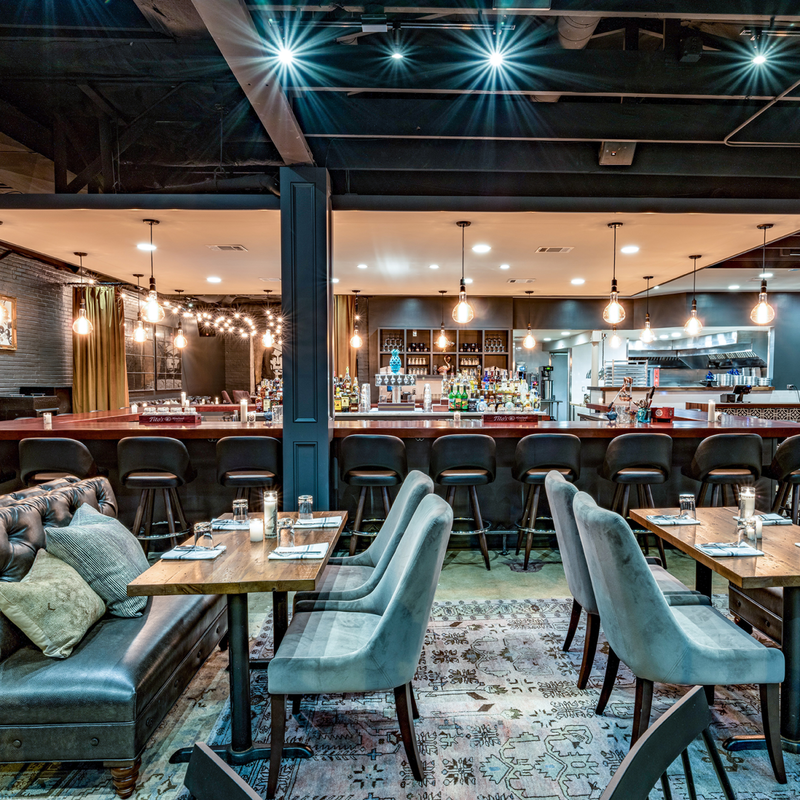 Speer has surrounded herself with an all-female, all-star team of industry vets, including pastry chef Britt Castro, award-winning beverage director Jen Keyser, and general manager Sarah Bevil. Having worked together at places like Contigo, Swift's Attic, and Geraldine's, these ladies are not just co-workers but more like sisters who know each other well and thrive in each other’s mutual respect and admiration. 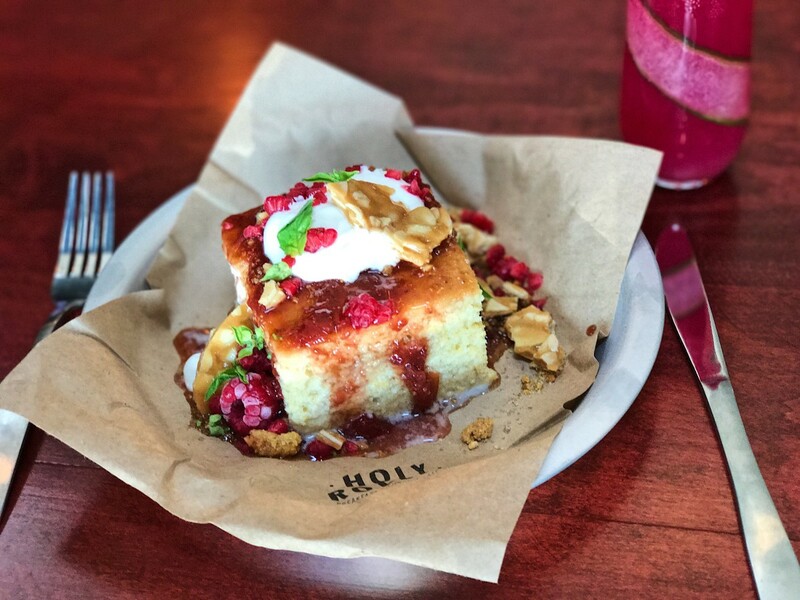 This synergy contributes to the cool vibe and whimsical menu at Holy Roller. You know that recent trend to “put an egg on it for $1”? 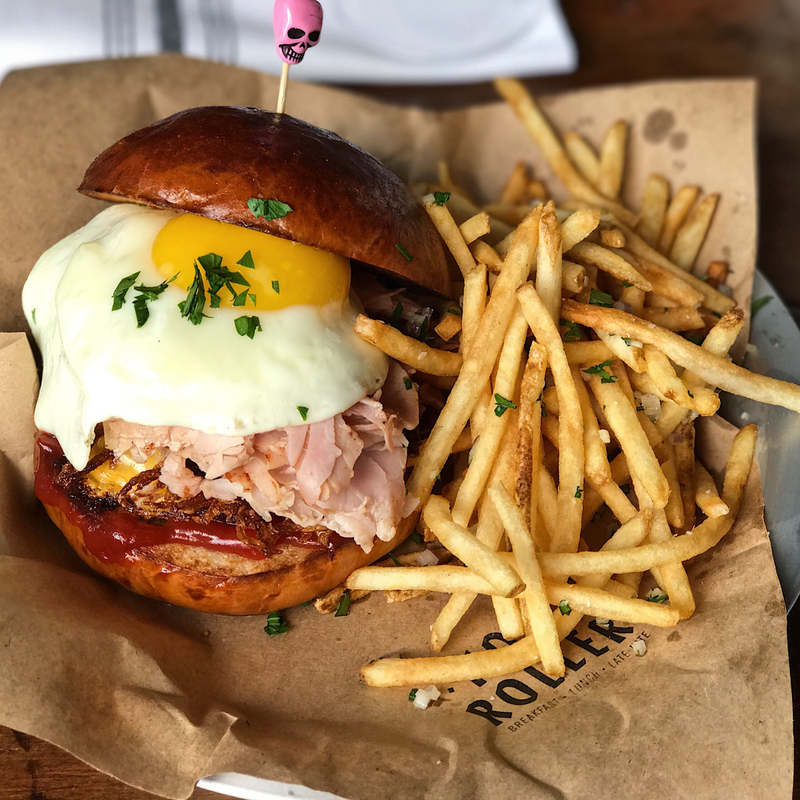 Well, at Holy Roller almost every menu item already comes with an egg. Do you feel like having a meatloaf sandwich at 10 am? Do you crave breakfast for dinner? 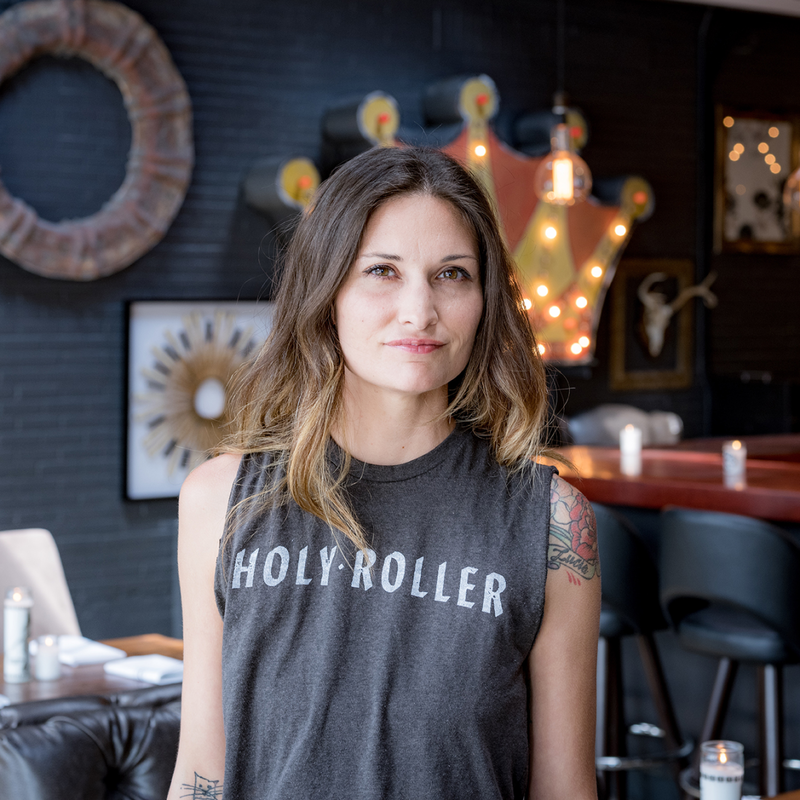 Holy Roller has you covered with a variety of breakfast sandwiches, pancakes with fried chicken strips and Sriracha butter, and a massive kolache stuffed with migas and queso, topped with jalapeño slices. 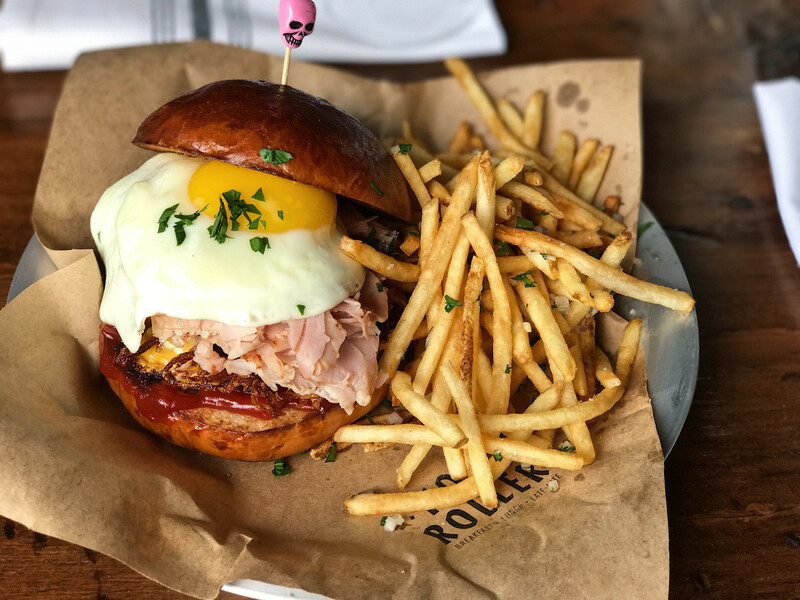 The Bombshell burger, featuring finely chopped shaved ham, hash browns, melty American cheese, and house-made ketchup rivals the best burger we’ve had this year (which happens to be at Speer’s husband’s acclaimed Bonhomie). Those looking for lighter fare can enjoy salads, such as the romaine and roasted corn, served with cotija cheese, pickled radish, and green goddess dressing, or the Waldorf, which veers from the mayo-coated classic opting for lightly dressed greens with grapefruit whipped cream on the side. House specials are available during traditional brunch hours on the weekends, plus the "Sunday School" menu features pastry and cocktail specials from a "seven deadly sins" display. But the fun is just getting started. 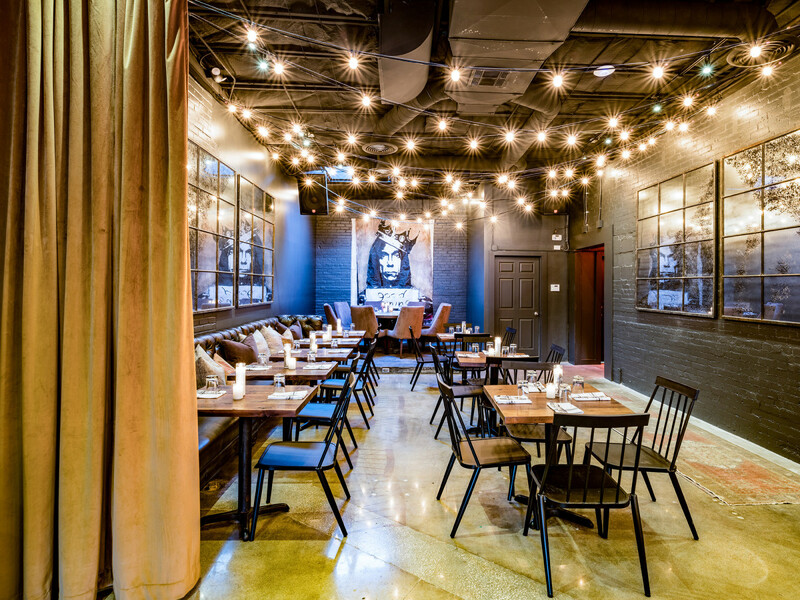 The bar menu crafted by Jen Keyser focuses on seasonal drinks that you can "drink all day" and brunch favorites. It’s hard to choose a winner, but Lust for Life is an early best-seller combining Tito’s vodka with Ancho Verde liqueur, fresh lime, and Jarritos tamarind soda in a salted-rim glass. 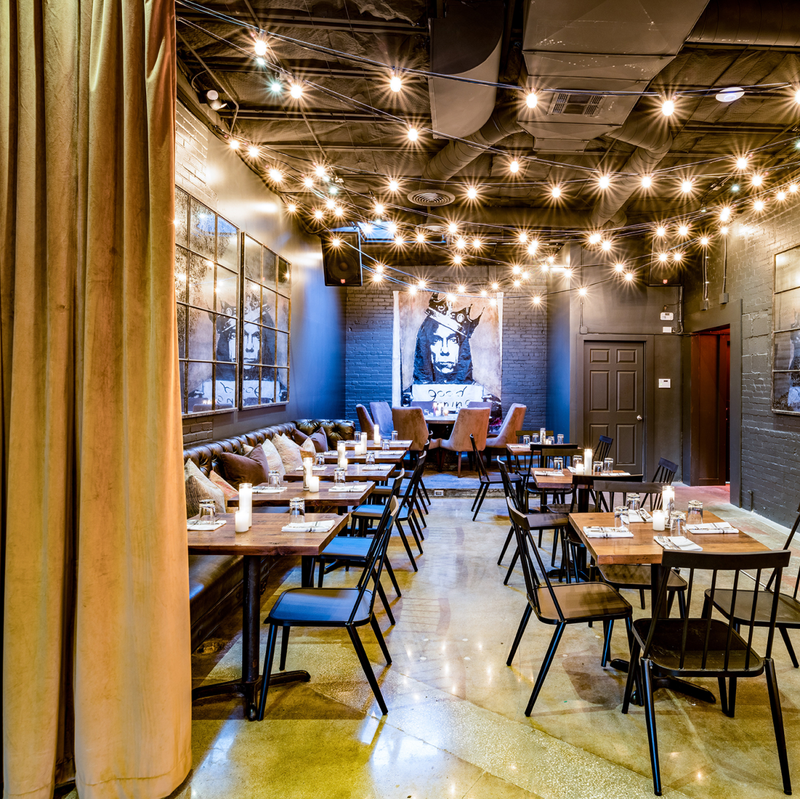 And forget the iced tea — Keyser also concocted refreshing Topo Chico-topped shrub sodas like peach-basil, grapefruit-habanero, and cherry-sorrel, as well as custom-made mocktails, all with the option to add a spirit and/or beer if desired. Spritzer and Bloody Mary pitchers are available on weekends, the latter accompanied by a table side, build-your-own garnish offering. Wine and beer options are not ample but are well-curated, and of course, bubbles and sparkling wines are at the forefront. 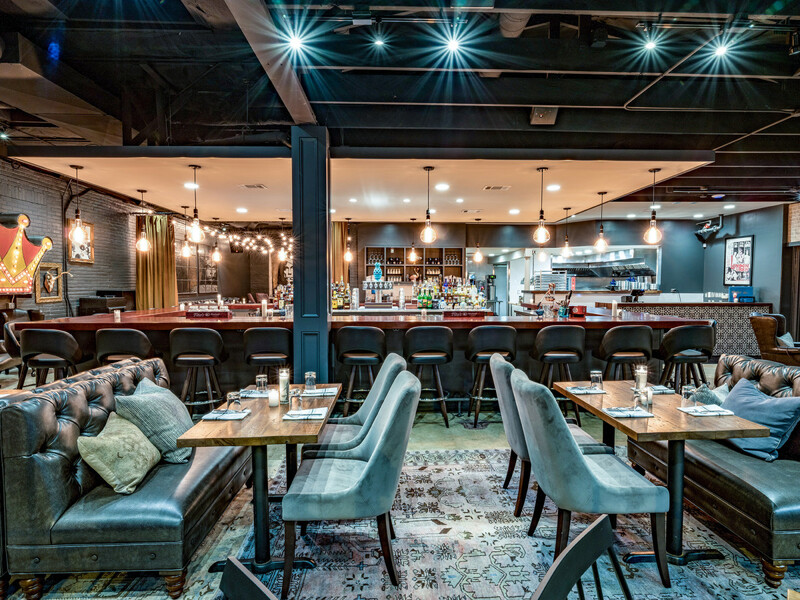 The transformation of the Wahoo’s space is nothing short of stunning, with a style reminiscent of a rock star’s high-end living room. 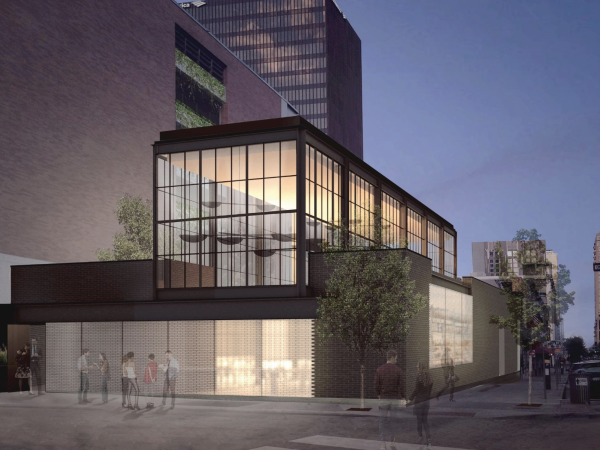 Architect Lee Alexander transformed the floor plan into areas for morning grab-and-go ordering, lounging over a cup of coffee, or sharing drinks with friends. Interior designer Jen Dipasquale added a mix of comfy sofas and chairs from Briley's and funky flea market treasures from Roundtop. 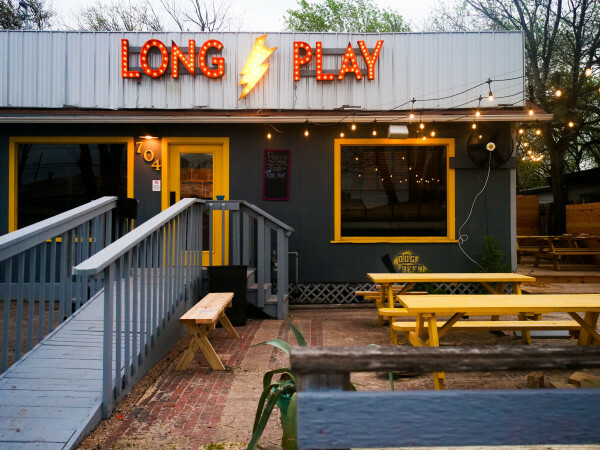 Longtime Austinites will recognize iconic signs such as the original Cothron's locksmith which graces the entrance to the restaurant, and the Club de Ville crown, both reinvented and refurbished by neon artist Evan Voyles. Before you leave, check out the cool bathrooms decked in breakfast-themed graffiti by Arts and Rec. 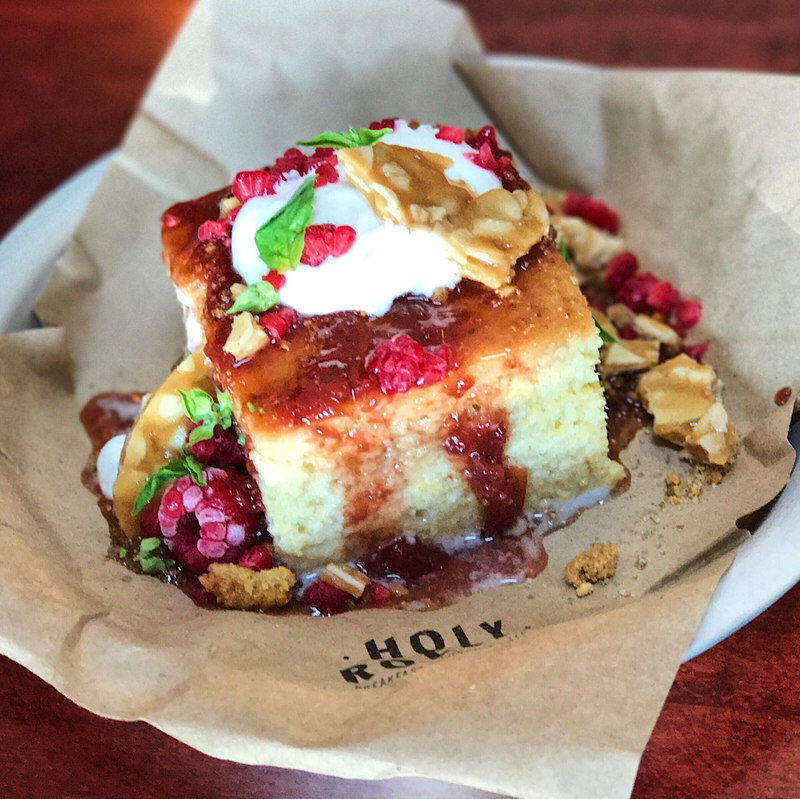 Holy Roller is open seven days a week; counter service starts at 8 am. The full menu is available Monday through Saturday, 10 am to 10 pm. Sunday brunch is served 10 am to 4 pm. 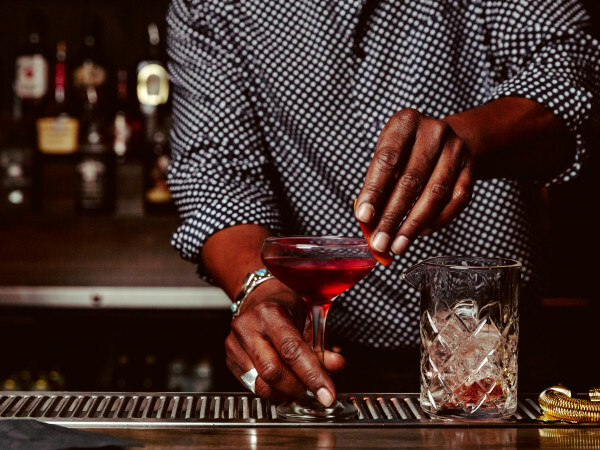 The bar is open late — until 1 am Friday and Saturday.